You will find in these two parts in alphabetical order the 14 LFB women teams starting their season with the LFB Open end of October 2007. Although the team won their first five rounds of games last season, topped the league and appeared to be able to challenge for the regular season title, their year turned into a roller coaster after loosing their 6th match and then the bubble burst finally after the club's early elimination in the Eurocup and non-participation in the French Cup. The squad has little resemblance to that of last season, starting with a new head coach, Erick Lehmann. This is his first adventure in the world of women's basketball. The loss of Cathy Joens, last season's top scorer in the LFB will be felt. With K. B. Sharp still on board the team have one of the best point guards in the league. This roster have one of the tallest attacks (1.87m) but apart from Magali Lacroix in the centre they are light-weighted. This is their second season in the elite division. Last year they surprised everybody right from the start: At the LFB Open they took Bourges to the wire before losing (68-66). Yet they did eventually beat Bourges during the regular season, a defeat that was to cost Bourges the regular season title. The arrival of Liz Moeggenberg in January sparked the revival of the club as they started to win close games and qualified comfortably for the play-offs. They also qualified for the semi-final of the French Cup. Arras is a club that depends on the quality of home-grown players and the recruitment of Barennes and Gruszynski is part of their philosophy. The hope is that the recruitment of the foreign players will compensate for the loss of Zuzana Klimešová and Liz Moeggenberg. Looking at the present composition of the roster they should be strong from down-town as they have three established shooters from beyond the arc and with the acquisition of Bareness they have a player who can alternate between small forward and power forward (3 and 4). The roster is a good mix of experience and youth. Pierre Fosset, the president of the club, likes to work in cycles and it is no surprise that seven members from last season's roster are still at the club. His believe in youth integration is strengthened by the signing of Serbian Sonja Petrovic who is still only 18 years old. The composition of the team is such that they are covered in all the departments: They have six players measuring at least 1.88m, therefore have the rebounds covered. With Belinda Small they have a 3-point shooter of excellence, not forgetting Céline Dumerc and Cathy Melain. Last season Calais was competitive until the end of November and then you could say that is when the season ended. It is difficult to pin-point the problem with this club in the LFB because they have done well in the junior section for the last few seasons. Lina Bradzdeikyte played for Lithuania during EuroBasket Women 2007 and was at times inspirational This team will require that from her in every game as most of the players on this squad are inexperienced in the LFB. Corrine Benintenti is the only women coach in the LFB and likes to play fast tempo basketball. This factor combined with the difficulty dislodging her side at home resulted in them finishing comfortably in 7th place during the regular season. Last season it was Jessica Moore coming from the WNBA and having a great season, this time around the WNBA are represented by the duo Davenport and Jackson. The defensive qualities of both players are well known and with the experience of Luptakova and Frniakova Challes are well equipped to maintain their position as outsiders. The LFB Open 2006 is an event that Clermont-Ferrand would like to remove from their history as they suffered a walloping defeat (81-33) against Mondeville. After such a poor start things could not get any worse and despite having only seven players for most of the season they did enough to move out of the relegation zone and finish the season on a high. Everything at the club has changed for this season: Emmanuel Coeuret makes his début as a coach in the LFB after years as the number 2 at Mondeville and there are six new players. On closer observation of the roster one thing is clear, this squad is made up of many shooters from down-town which should compensate for the inside game which appears to be missing. Depending on how you qualify 5th place, last season was not an easy one for Mondeville. Injuries to key players at critical moments in the season never allowed them to play at full strength. Despite the lack of consistency domestically, they played well in the EuroLeague. The season did not all end in doom because the youth team, managed by Emmanuel Coeuret, retained the title of French Champions. 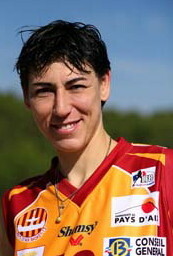 Pauline Jannault is one of five players taller than 1.90 on this roster, she is also a shooter from down-town. When you add Aubert and Williams Mondeville is well covered in this department. The composition of the roster with some experienced players and young athletic players should see them through the domestic and EuroLeague campaign and they should be better than last season.